Citation Information: J Clin Invest. 2007;117(12):3879-3889. https://doi.org/10.1172/JCI32614. The R200W mutation in the von Hippel–Lindau (VHL) tumor suppressor protein (pVHL) is unique in that it is not associated with tumor development, but rather with Chuvash polycythemia, a heritable disease characterized by elevated hematocrit and increased serum levels of erythropoietin and VEGF. Previous studies have implicated hypoxia-inducible factor–1α (HIF-1α) signaling in this disorder, although the effects of this mutation on pVHL function are not fully understood. In order to explore the mechanisms underlying the development of this polycythemia, we generated mice homozygous for the R200W mutation (VhlR/R). VhlR/R mice developed polycythemia highly similar to the human disease. 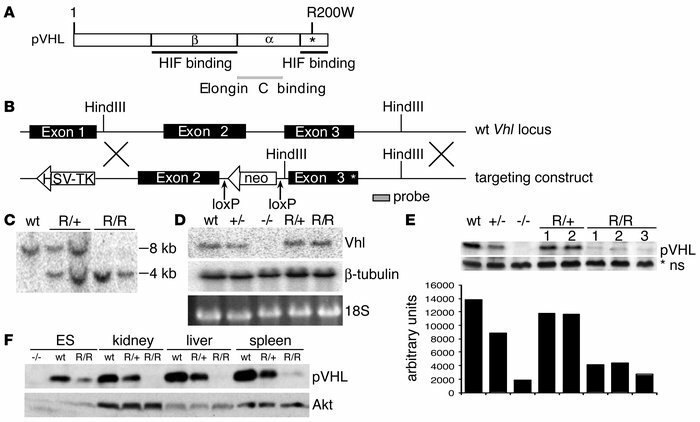 The activity of HIF proteins, specifically the HIF-2α isoform, was upregulated in ES cells and tissues from VhlR/R mice. Furthermore, we observed a striking phenotype in VhlR/R spleens, with greater numbers of erythroid progenitors and megakaryocytes and increased erythroid differentiation of VhlR/R splenic cells in vitro. These findings suggest that enhanced expression of key HIF-2α genes promotes splenic erythropoiesis, resulting in the development of polycythemia in VhlR/R mice. This mouse model is a faithful recapitulation of this VHL-associated syndrome and represents a useful tool for studying polycythemias and investigating potential therapeutics. Generation of VhlR/R ES cells. (A) Schematic representation of human pVHL showing the location of the R200W mutation (asterisk). (B) Targeting construct used to introduce the R200W mutation in murine ES cells by homologous recombination. (C) Southern blot genotyping of ES cells using the probe indicated in B, showing heterozygous mutant VhlR/+ (R/+) and homozygous mutant VhlR/R (R/R) clones. (D) Northern blot analysis using the probe indicated in B, confirming that the Vhl transcript in VhlR/R cells was the same size as that in WT cells. (E) Western blot demonstrating that expression of pVHL in VhlR/R cells was decreased compared with WT cells. As quantitated below, mutant pVHL levels were 30%–40% those of WT. *ns, nonspecific band for loading control. (F) Expression of mutant pVHL was also significantly decreased in the kidney, liver, and spleen of VhlR/R mice compared with WT and VhlR/+ littermates.